SAN LUIS, Orange Walk District, Fri. Dec. 2, 2016–An angry land owner of San Luis, on whose land the main road connecting San Roman to San Luis was constructed, blocked vehicular traffic for about three hours this morning when he closed off both sides of his land, bringing traffic to and from the villages to a standstill. Orange Walk Police and an official from the Ministry of Works and the Lands Department intervened, and an agreement was made with the irate land owner, who then removed the barrier from his land and traffic resumed. Teofilo Chi, the landowner, said that if he is not given compensation, he will seek the services of an attorney and take action. In an interview on CTV 3 News Orange Walk today, Chi said that when the road was being constructed by the Ministry of Works, he told them that they were constructing the road through his land. He was told to go to the office, which he did several times, but he was ignored. So, he then decided to close his property. ASP Jose Mendez, Deputy Commander of Orange Walk Police, told us that, on their arrival, they saw 6 posts, 3 on each side of the property, dug in the road, blocking the road. 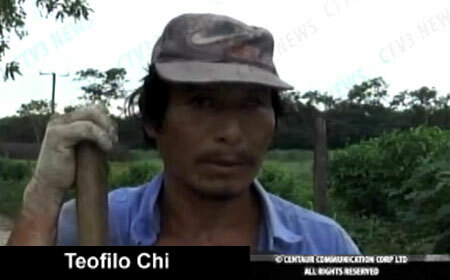 He said that he was not sure what arrangement was made with Teofilo Chi, but an agreement was at that point made. We tried to get a clarification of the situation from the Ministry of Lands, and were directed to the Commissioner of Lands, but despite our efforts, we got no response.